Kansas City has come into its own as a center for culture and entertainment, rivalling the Chicagos and Austins of America. But that’s a more recent development. The one thing KC has had On Lock for over a hundred years is its BBQ, arguably the best in the country. In the early 1900s, Henry Perry moved from Memphis to Kansas City. He’d been a steamboat cook on the Mississippi River, but in KC he started cooking huge slabs of meat in a pit over oak and hickory, and wrapping the meat in newspaper for customers. For upwards of twenty-five cents, people were devouring Perry’s meats, which were known for their harsh, peppery flavors -- Some of that harshness may have come from the type of meats Perry was using, which included beef, but also possum, woodchuck, and racoon. Look, KC will put BBQ sauce on anything ... though you won’t find those more gamey meats in any BBQ joints here. After Perry’s death in 1940, his business passed to Charlie and Arthur Bryant, one of Perry’s former workers founded the competing Gates Bar-B-Q and a whole generation of Kansas City BBQ institutions established themselves. Collectively, they moved towards a flavor palette that is equal parts sweet, spicy, and tangy, often based in a thick sauces that use ample tomatoes and molasses. KC BBQ is defined by its wide variety of meats. While the Carolinas are famous for pulled pork, Memphis for its ribs and Texas for its brisket and sausage, all of them are part of the fold in Kansas City. With that said, Burnt Ends, flavorful, fatty cuts from the end of a brisket, have a special place in the city’s heart. And that’s the, uh, rub here: KC BBQ is your best bet when you want to try incredible cooking from across the flavor spectrum. That’s also why side-dishes are just as important to the KC experience as the meat itself. Bryant? Of the Kansas City Bryants? Indeed. This is one of those elite lineage sites. With roots that go back to Henry Perry himself, it’s an undeniable cornerstone of the KC BBQ story. The sauces come Rich & Spicy or Original, and the servings are plentiful. Luckily, choices here are exceptionally streamlined. There’s six meats, ribs, fries, onion rings, and some choices for the kids. Throw a dart at the menu and chances are you’ll be satisfied with what you’re taking home. They’re also so proud of their white bread that you can just buy a loaf of it. It’s… actually worth it. 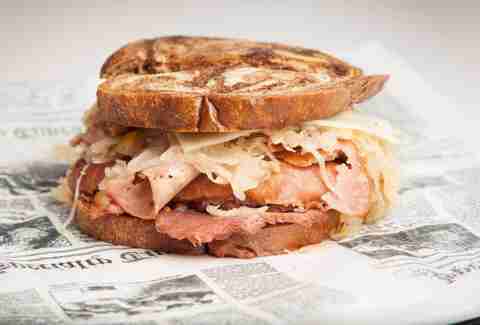 What to order: Try mixing meats on the sandwich. You can’t go wrong with a half brisket, half burnt ends. Masterpiece KC sacrificed quality with their decision to mass-produce their sauce, but Gates has been selling multiple sauces and rubs since the 1970s and it has only helped their business. 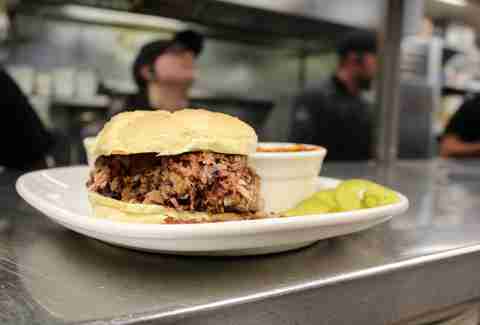 With locations all around the city, Gates is the BBQ of the people, for the people. You can always walk in and grab a no nonsense family style platter: thin shaved beef atop white bread with your choice of sauces ranging from mild to sweet to hot. There’s a universal nature to Gates, which is why the walls are covered in photos of world leaders stopping by to eat. What to order: Honestly, just grab anything. Just make sure you try the steak fries, which are seasoned to perfection. Look, it’s hard to play favorites here, but a lot of places you might look to are gonna this one at #1 for close. We're not here to spit in the face of conventional flavor wisdom. Jack Stack is very good. While there are a few locations, you absolutely must visit the Freight House, where 25 foot ceilings in an old freight yard are complemented by mood lighting… and one of the best meals of your life. Like everywhere else in KC, the burnt ends are a must try, but the tangy sauce that will drench everything on your plate is so perfect you’ll be lapping it off your fingers. As for sides, the cheesy corn, fries, BBQ shrimp and cornbread are all equally unmissable. 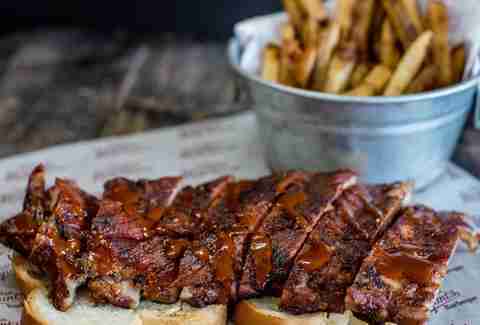 What to order: An order of Jack’s Best gets you prime rib, baby back ribs, and burnt ends. Not sure what else you could ask for? 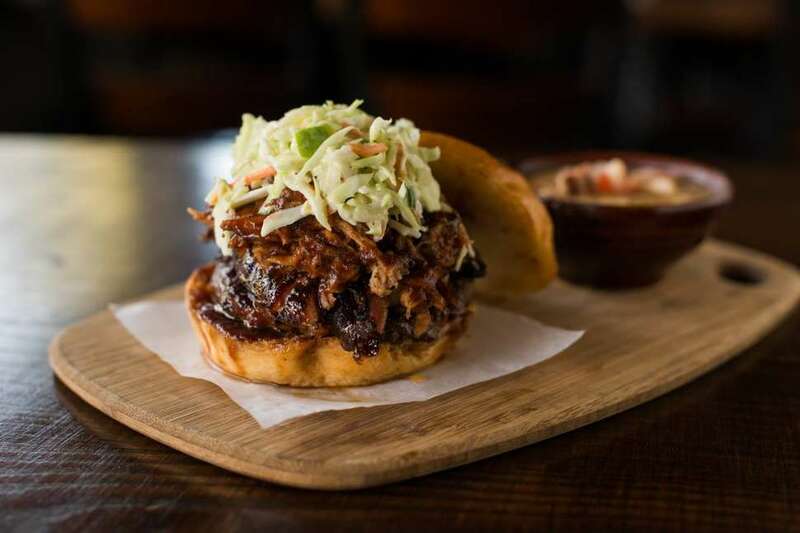 There’s a reason Joe’s made our list of the best BBQ spots in the country. It’s a BBQ joint located inside a functioning gas station. If that’s not appealing to you, you’re gonna miss out on the most midwestern meal you can possibly imagine. The menu here is separated into meat and “other stuff.” We highly recommend both. Most of the full BBQ dinners are based on availability, so it’s best to show up at Joe’s with no plans but a belly that needs to be filled. Also, be prepared for a bit of a wait. You’re highly encouraged to scarf down your meal and then get out of the way for the next guests. And if you’re not making it out to KC anytime soon, Joe’s shipped frozen meats reheat shockingly well. 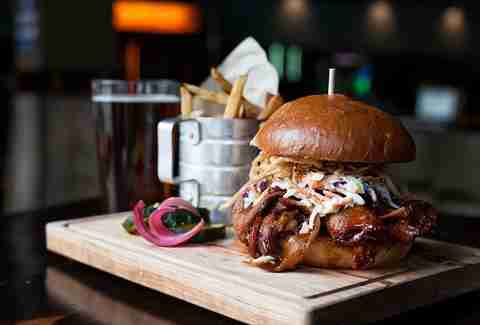 What to order: The Jumbo Rocket Pig is one hell of a pulled-pork sandwich. Founded just four years ago, Q39 uses techniques classically-trained chef/owner Rob Magee honed during a decade on the competitive BBQ circuit. The wood fire grill and smoker fired at each meal guarantee that you’re getting the freshest possible meats. And the meats, they are a-plentiful. 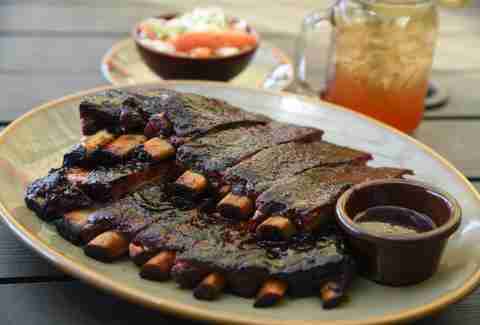 Championship quality plates piled high with spare ribs are only a portion of what you need to prepare for. The sausages are some of the finest in the city, and the chicken is equally impressive. What to order: Grab the Judge’s Plate and as many sides as you can handle. Do Not skip out on the mac-and-cheese. A two minute drive from Q39, you’ll find Char Bar. This joint has a huge outdoor space with patios, fire-pits, games for kids, and a very dog-friendly lawn. Having a drink here with a plate full of BBQ while the sun goes down is hard to top. There’s also a beer garden and plenty of options for anyone with food allergies. What to order: Burnt Ends. But if you’re here to go all out, ask them about The Whomp Platter. The ideal spot for early risers. You have a ticking clock on Slap's. Each day, Slap's BBQ opens in the morning and proceeds to sell its award winning dishes until it sells out. And it sells out every day. So if your plan is try to showing up after 2pm you needn't bother. Everything they do is fantastic, and they're the only BBQ joint on this list that also warrants a recommendation for their Taco Tuesdays as well. Yes, I'm serious. Slap's can do no wrong, and the competitive nature of trying to beat the rest of KC to this food is a great reason to make this place your second breakfast, even if you're not fully in the mood. 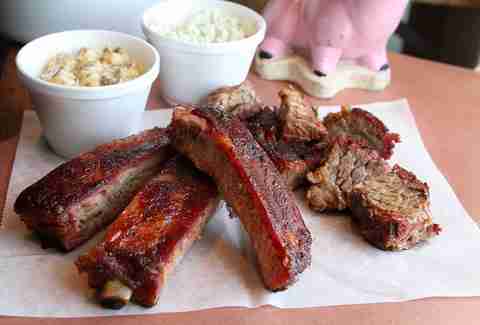 Burnt ends are a delight, but the real range of meat options is the draw of Hawg Jaw Que & Brew. The briskets, the french dip, the loaded fries, the wings -- they’ve got everything you need for dunking into their signature sauces. If you’re a beer-lover, they also have over twenty craft beers to choose from. What to order: For $17 the Hawg Trough Sampler lets you actually sample ALL of the meats here, and then throws in some sides for good measure. But don’t skip the brisket nachos. Sorry, they aren’t in the sampler. Brock Wilbur is Kansas City-based writer and a contributor to Thrillist.